It has taken about seven months to carve the pieces for my Norton Hospital commission, "Cor Liberum". I have been telling folks that it seemed like it took twice that long for the two big figures to go from the elevated deck down to the pedestal. When the last seven months of your life is dangling from a crane 25 feet in the air, it is a very helpless feeling! When it has to happen twice, you can only imagine the stress! However, the crew from Methods and Materials out of Chicago did a superb job in rigging and setting the figures. On both figures, they were able to template the rods and set them perfectly the first time. Below are 2 videos showing the figures lowered over the edge down into the courtyard and being set in place. Its hard to believe that the small one is 4500 pounds and the big one is 6200 pounds. They make it look easy! It was a very long day yesterday! I had to transport the stone pillars to the monument company in Elizabethtown, KY yesterday morning. It was pouring rain and the pallets were not easy to move. But, I got that done and was on to the next step. Picking up and delivering the stainless steel posts. You can see the lack of head room we were dealing with to get these guys unloaded. The picking up was the easy part. Although they filled the back of a 26 foot flat bed truck. It was the unloading that was the challenge. "Cor Liberum" is being installed in a courtyard in front of Norton Hospital - Audubon Campus. To get to the courtyard, you have to enter through the parking garage. The lack of height in the garage means not many pieces of equipment will fit. So, we had to unload the poles outside of the garage and place them on a trailer. We then drove a trailer through the narrow isles up two floors of the garage. Mark Hendren owner of Lay-em-all Masons showed off his driving skills just to get them in place where we could unload. We then used a small Genie forklift to unload the poles and place them in the courtyard. I was lifting and guiding the poles. If I was still in my 30's, that might not have been a big deal, but at 50, I realized that I am getting too old for that type of work!! So, the good news is that the poles are on-site and ready for Methods and Materials out of Chicago to come in and do their magic starting Tuesday. More to follow as we close in on finishing "Cor Liberum". It is very hard to believe, but "Cor Liberum" begins installation in just a few days. I will begin delivering components tomorrow! I have had an upset stomach all week. This is that part I hate. When I see the last 10 months of work being lifted and put on a truck for transport, my heart is in my throat. When the crane lifts my babies over the side of a wall and into a courtyard, I will be difficult to watch. However, my installers, Meathods and Materials out of Chicago are the best! Roger Machin has been such a calming force that it has helped ease my stress. History pillars ready to transport for engraving. Three of the birds with their stainless steel sleeves epoxied in place. The crane came out last week and weighed the central figures. They were 6800 and 4500 pounds. When the blocks came to the studio, they were 18000 and 17000- pounds a piece. The five birds were carved from blocks weighing around 2000 pounds. They are down to around 150 to 225 pounds. I wish I could say I went on that same diet!! This commission has been a very interesting and personal journey. The whole experience has such meaning to both the hospital and me. The experience will create a park like setting for the hospital patrons. It will create a home for my idea to come to life. I am very nervous, but also excited to see the hard work come to life. 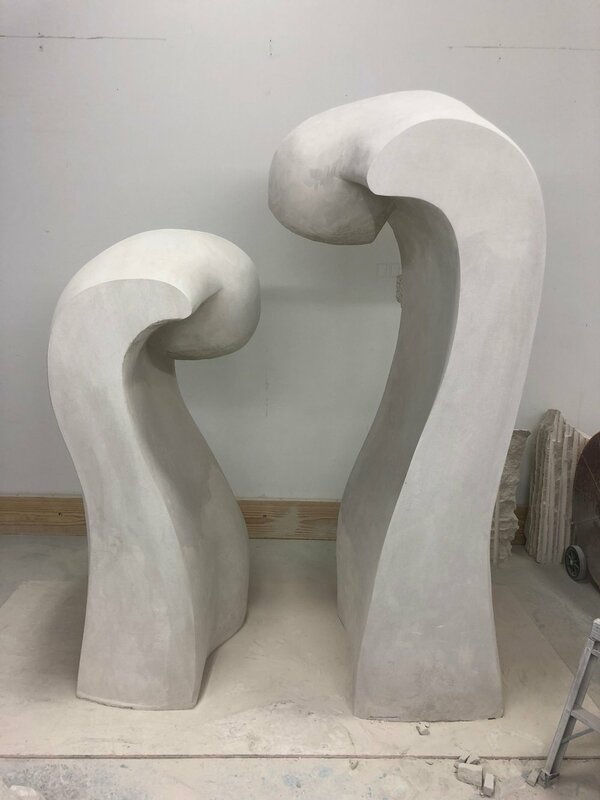 The Care Giver and Patient, the central elements of "Cor Liberum"
As I continue to march towards the installation date of February 26th for my Norton Hospital commission "Cor Liberum", it feels good to be in a place where I am confident I will be ready. Back in November, I was very stressed out as I was not on schedule to be able to complete the sculpture on time. The large figure (the Care Giver) was carved and standing up. However, the small figure (the patient) was not even close to being done. Also, at that point, I had one bird complete and sanded but without the mounting collar attached. I did have a good start on all of the rest of the birds, but none of them had seen a sander at that point. Since then, I have finished carving the small figure and I received help from fellow Louisville artists, Karen Terhune and Chris Mozier. They spent a lot of time sanding and refining of the central figures. I have made great progress on the sanding of the birds and am fitting their mounting collars. This has gone a lot faster than I thought. It has been a non-stop process, but I am nearing the end. These are the stainless steel posts that the birds will be sitting on. This past Thursday, representatives from Norton Hospital came out to do a studio visit. They were very happy with the work. I asked them if it was what they were expecting, and they said it absolutely was. They said it look just like the model! It is most important that I like my work, but it sure helps when the folks that are paying for it like it! There is still a lot of coordination work that needs to happen over the next month. 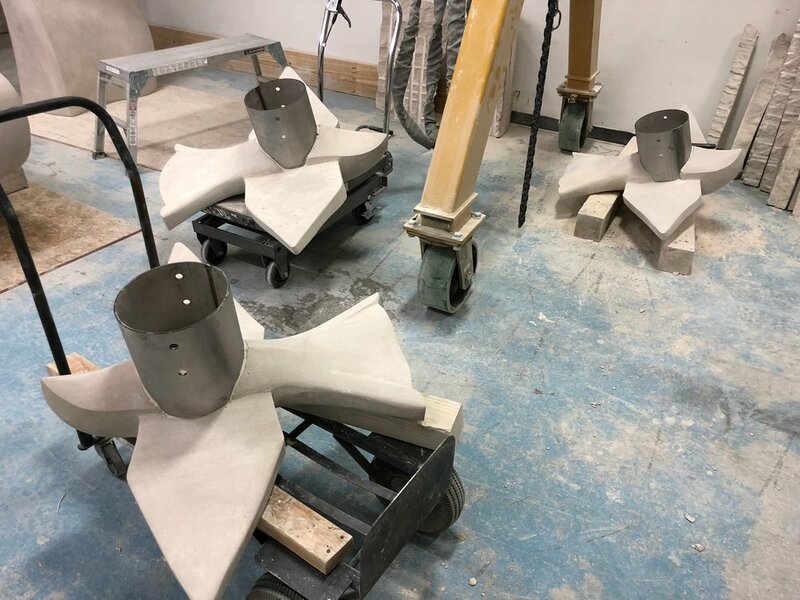 The concrete is sill to be poured, the sculptures still need to be totally finished and delivered, and the installation crew still has their work to do. But, I feel like the bulk of the work is behind me. Wish me luck the week of February 26th as there will be a lot of work that has to get done in those 5 short days to complete the sculpture.